Fighters featured on the undercards of the highly anticipated Canelo vs. Chavez, Jr. showdown today hosted a Los Angeles media workout at City of Angels Boxing ahead of their upcoming fights on May 6 at T-Mobile Arena, live on HBO Pay-Per-View. Plus, fighters featured on Golden Boy Boxing on ESPN on May 5 at the MGM Grand Garden Arena joined the action today also to discuss their upcoming bouts. 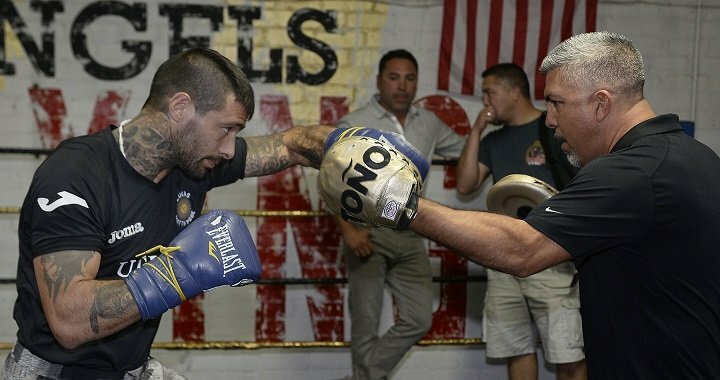 On the Canelo vs. Chavez, Jr. undercard, Lucas “La Maquina” Matthysse (37-4, 34 KOs) will take on Emmanuel “Tranzformer” Taylor (20-4, 14 KOs) and Joseph “JoJo” Diaz, Jr. (23-0, 13 KOs) will be defending his NABF title against Manuel “Tino” Avila (22-0, 8 KOs) on HBO Pay-Per-View® beginning at 9:00 p.m. ET/6:00 p.m. PT. As part of the HBO Free-View, Ryan “Kingry” Garcia (8-0, 7 KOs) will face a soon to be announced opponent and Raul “El Cugar” Curiel will make his pro-debut against an opponent to be named shortly. Also on the card, Ronny Rios (27-1, 12 KOs) will fight Daniel “El Chato” Noriega (28-10-1, 15 KOs) and opening up the night, Joseph “Diamante” Aguirre (16-0, 9 KOs) will be battling Angel Aispuro (8-4-2, 5 KOs). The May 5 action-packed night of Golden Boy Boxing on ESPN will be headlined by former three-division world champion Yuriorkis Gamboa and Robinson Castellanos. Co-main event of the night, Abraham “Chamaco” Lopez (22-0-1, 15 KOs) will defend his NABA featherweight title against Jesus Rojas (24-1-2, 17 KOs). Oscar “El Jaguar” Negrete (15-0, 6 KOs) will be participating in the card in a 10-round bantamweight bout, and knock out artist Vergil Ortiz, Jr. (4-0, 4 KOs) will be in a four round super lightweight fight against Angel “Pescado” Sarinana (7-5-2, 3 KOs). “I’m excited to see every undercard fighter on fight night. I love knockouts, so you can’t go wrong with our co-main event of David Lemieux against Marco Reyes. Lemieux just had a spectacular knockout over Curtis Stevens that was incredible, so I’m looking forward to seeing him in the ring again. “I never once thought about retiring. I just needed a deep rest after the Postol fight in October, so I went back home and took the time I needed to be with family–I drove my motorcycle, went fishing, and just reflected. “Fighting on this Canelo vs. Chavez, Jr. card has been the opportunity of the lifetime for me. I have to go out there with millions watching and thousands in attendance, so I have to showcase to everybody that I can be the best and the next superstar in boxing. “Everything has been great–I just had my son, which is extra motivation for me. I’m at 122 pounds now, because after my loss, my motivation and discipline went way up. “I’ve been training over a year with Joel Diaz, and have been sparring with Lucas Matthysse and Vergil Ortiz, Jr. to prepare for our fights on May 6th. I have about 200 people coming from Mexico to see me fight, so I’m really excited. “I’ve been feeling really good lately and have been training since February so I’m in the best shape of my life right now. It feels really to be on such a huge fight card. When I fought on the last Canelo undercard, it was huge for me-it still takes some adjusting, but I feel great. Canelo vs. Chavez, Jr. is a 12-round fight presented by Golden BoyPromotions and sponsored by Tecate, BORN BOLD, O’Reilly Auto Parts, Adriana’s Insurance and Interjet. Lemieux vs. Reyes is presented by Golden Boy Promotions in association with Eye of the Tiger Management, Matthysse vs. Taylor is a 10-round fight presented by Golden Boy Promotions in association with Arano Boxing and Star Boxing. Diaz, Jr. vs. Avila is presented by Golden Boy Promotions. The event will take place on Saturday, May 6 at T-Mobile Arena and will be produced and distributed live by HBO Pay-Per-View® beginning at 9:00 p.m. ET/6:00 p.m. PT. Golden Boy Boxing on ESPN: Gamboa vs. Castellanos is a 10-round lightweight fight presented by Golden Boy Promotions in association with ZR Entertainment and sponsored by Tecate BORN BOLD. ESPN Deportes will transmit the fights live on Friday, May 5 from the MGM Grand Garden Arena at 4:00 p.m. PST/7:00 p.m. EST, and ESPN2 transmission will begin at 5:00 p.m. PST/ 8:00 p.m. EST. May 6: Tickets for the closed circuit telecast of Canelo vs. Chavez, Jr. are priced at $75, not including applicable fees. All seats are general admission and tickets are available for purchase at any MGM Resorts International box office or concierge desk. Tickets also can be purchased by phone with a major credit card at 800-745-3000. Tickets for “Canelo Alvarez vs. Julio Cesar Chavez, Jr.” in theaters nationwide are on sale now at www.FathomEvents.com or at participating theater box offices. Fans throughout the U.S. will be able to enjoy the event in select movie theaters through Fathom’s Digital Broadcast Network (DBN). May 5: Tickets starting at $10 for Golden Boy Boxing on ESPN are on sale now and include complimentary VIP reserved seating at the Canelo vs. Chavez, Jr. Weigh-in. Ringside seats for fights only are priced at $30. To charge by phone with a major credit card, call the AXS Contact Center at (888) 929-7849 or MGM Resorts Call Center at (877) 795-2564. Tickets are also available for purchase online at www.axs.com or www.mgmgrand.com and in person any MGM Resorts International box office. The premiere of the HBO Sports presentation Face Off with Max Kellerman: Canelo/Chavez Jr. airs Saturday, April 29 at 12:15 a.m. on HBO.